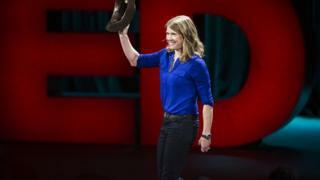 Space archaeologist Dr Sarah Parcak has become this year's winner of the TED (Technology, Entertainment and Design) prize. The $1m prize is awarded each year to an individual who is judged able to spark global change. Dr Parcak is using the money to set up a website to crowdsource as yet undiscovered sites around the world. The so-called citizen scientists will also be called on to spot and report looting at existing sites. Dr Parcak is known as a space archaeologist because she uses satellite imagery collected above the Earth and analyses it using algorithms to identify subtle changes that could signal a hidden human-made structure. Her satellite mapping of Egypt has already suggested the existence of 17 hitherto unknown pyramids, 1,000 tombs and 3,100 settlements. Each TED prizewinner must articulate how they will spend the money via a "wish". Dr Parcak's is to get the world more engaged in archaeology. "I wish for us to discover the millions of unknown archaeological sites across the globe," she said. "By creating a 21st Century army of global explorers, we'll find and protect the world's hidden heritage, which contains humankind's collective resilience and creativity." Her website will offer the public access to satellite imagery and tutorials to help spot potential sites. Users will be asked to fill in a checklist of what they have seen. Although they will be given imagery, they will not know the exact location of the sites they are exploring to prevent possible looting or misuse of information. "If 50 people say that they have seen a tomb, then we will think that it is worth a look," she explained. She added that the site would be launched in a game format. Users will be given points and high-scorers could win the opportunity to be involved in digs via social media if archaeologists follow up their discoveries. "Archaeology is currently at a tipping point," she told the TED audience on accepting her prize. "Isil is blowing up and looting temples in Iraq and Syria. If we don't do something, these sites will be gone." The volunteers will also be called on to spot evidence of sites being raided and treasures stolen by locals who are desperate for money. Dr Parcak's team has spent the last six months looking for looting pits in Egypt, which are distinctive and relatively easy to identify. She said they had uncovered evidence of excavations across the country where people had tunnelled underneath to steal mummies, jewellery and other valuables. "We can't keep up, we are losing the battle. It is heartbreaking," she said. She hopes that by engaging an army of citizen scientists, some of the treasures at the ancient sites in the Middle East can be saved. "If the platform can detect looting early enough we can alert the authorities and start protecting the site," she said.